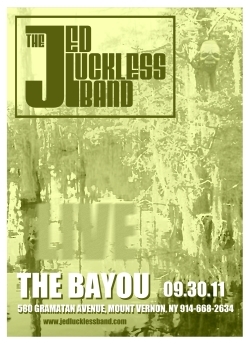 The Jed Luckless Band returns to The Bayou and delivers another great rock & roll show. This is truly an “audience” recording, and you can hear what a great time the crowd is having. The band is obviosuly having fun too, opening the show with a brand new original “Still In Luv With U” and following it with a rocking first set that includes a very nice “Smile Forver,” a first time attempt at Phish’s BOTT and an energetic Franklin’s closer. Second set heats up, delivering a solid Ozone Blues, a spacey Ghost jam, a Psycho Killer bust out for the crowd, and an extrememly high energy “Suzy Greenberg” show ender.